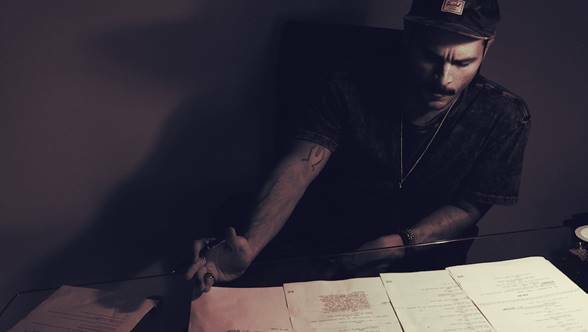 Actor turned singer-songwriter Michael Malarkey returns with yet another gem of a song called Captain Solitaire, where he tackles the introverted life of an actor. Loving his rich, baritone vocals backed by a production and instrumentation that challenged the boundaries of modern folk music. Stream it below! Captain Solitaire is the title track of his upcoming 3-track EP set to arrive on May 23rd on Hudson Records. Self-described as neuva-Americana poetry, the new songs are a further development of the songwriting and production that hit fans ears on debut album Mongrels back in 2017. I was very excited to listen to this EP and get my fix on new Michael Malarkey music and I am definitely impressed. Second track Friends references the difficulties balancing a ridiculous filming schedule with touring, further embellishing the theme of the loneliness revealed in the EP. My personal favourite is the Nick Cave-inspired Bloody Nose, because of its melancholy vibe and solemn piano keys. Simply stunning and I can't stop listening to it!! Malarkey is currently co-starring with Sheffield’s Sean Bean in new series The Oath.